Sunday School is a time-honored tradition that is new every Sunday! Our church family is a large one, and Sunday School offers everyone a special place to be. Sunday School is the place where people learn about the Christian faith in a loving, supportive environment. All groups meet at 10:00 a.m. Information about the classes is listed in our Sunday School brochure and on this page of our website. If you would like a more personal introduction, please contact us at contact@fumcaustin.org or (512) 478-5684. Our Sunday School classes offer adults a wide selection of age groups, study topics, and learning styles. Most adult classes are mixture of single and married people. Study topics range from the Bible and Christian beliefs to personal growth issues, family relationships, and current social concerns. A strong emphasis on fellowship and support makes these groups a vital part of the church community. A group of members predominantly in their 20s and 30s who enjoy coming together on Sundays for fellowship and faith. Outside of Sunday School, they love getting together for both service and social events. The class is new to FUMC and welcomes new faces. For more information, contact Chloe Potts at chloedpotts@gmail.com. A reconciling group of couples and singles in their 30s, 40s, and 50s who enjoy spirited discussions. We seek to grow together as we discuss topics of spiritual and social importance. Community service, fun, and fellowship are important to our class members as we prioritize giving back to the community and the church through discipleship in church-wide and class projects. Join us in the library, by 10 a.m. on Sundays, to experience a casual and friendly approach to serving the church and each other. For more information, contact Leslie Ivey at texasivey@att.net. Sunday classes begin by 10 a.m. with sharing of concerns of class members and visitors, followed by spirited discussions leading us to personal spiritual growth and working toward social justice. Discussion leaders are class members who offer varied references including the Bible and current Christian and secular sources. And outside the church building, class life includes service projects and fun social events. Visitors are always welcome! For more information, contact Bob Leeper at bobleeper@gmail.com or (512) 470-6933. Single and married, members of the Downtowners Class enjoy a wide variety of lesson topics and lively discussion, led by class members and guest speakers. 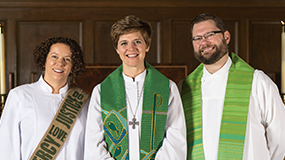 The emphasis is generally on social justice issues and spiritual growth, with strong support for FUMC’s mission outreach. The class was an early member of the Reconciling Ministries Network. For more information, contact Robbie Ausley at robausley@gmail.com. Looking for a place to drop in when you can? Want to meet some friendly people in a small group setting? Interested in Bible study and discussion? New to First Church and want to begin to feel at home here? Then the Drop In class is the place to be. We welcome adults of any age who can drop in on any or all Sundays and also people who have to arrive late or leave early because of other Sunday morning responsibilities. We discuss whatever Biblical passage the day’s sermon is based on, so there’s no advance preparation needed. Please drop in at 10:00 a.m. in the church parlor, directly behind the choir loft through the door on the right side of the altar area in the Sanctuary. For more information, contact Sandy Wilder at swilder@texas.net. Couples and singles in their mid 40s and up. Study topics include Bible, Christian art and history, current events, personal development, and mission programs. These open and exploratory classes examine challenging topics to deepen understanding and faith. All are welcome and encouraged to join the faith journey. For more information, contact Jim Bowen at jbowen2@austin.rr.com or (512) 918-1072. Couples and Singles in their 50s and up (mostly). Spirituality and scholarship combined in a lively discussions on a variety of topics, with emphasis on community service. For more information, contact Chip Morris at chipmorris@swbell.net or (512) 343-8599. Koinonia comes from the Greek word for “community.” Married and single, gay and straight, all ages are welcome to attend this lively and diverse group of people exploring spiritual, social, and theological issues of faith through extended book studies. Service and fellowship events are also part of group life. For more information, please contact Caroline Jones at byrdstarr@hotmail or at (512) 233-4834. A class of young couples who enjoy fellowship together on Sunday mornings as well as outside the doors of FUMC. Each Sunday a variety of lesson topics (and lots of discussion) are led by class members and guest speakers. Modern Families class members enjoy growing as Christians through service to others, involvement in the church, class social activities and helping each other when in need. Modern Families is a growing class that is always happy to welcome new faces. For more information, contact Jennifer Bevel at Jenc511@hotmail.com. A community of women of all ages, married and single. Programs include Bible study, personal and spiritula growth, and other topics, with an agenda for discussion and sharing. For more information, contact Carolyn Trigg at ctrigg@austin.rr.com. Couples and singles, 65 and up, led by a team of teachers providing Bible-based lessons. This lively group enjoys social activities and service and mission projects. For more information, contact Bill Martin at wjm34@sbcglobal.net. This Prodigal Men’s Study Group began almost 30 years ago as a Disciple Bible Study group, and continues to meet, studying a variety of works on the Bible, theology, faith as it relates to character, faith as it relates to the world, faith as it relates to science, and more. All men are welcome to join this study. For more information, contact Curtis Higgs at chiggs12279@peoplepc.com. Jim Bowen, retired research scientist now into religious research, leads this group of men and women for in-depth exploration of Scriptural texts. For more information, please contact Jim Bowen at jbowen2@austin.rr.com or 512-918-1072. First Church offers several short-term study opportunities during the fall, winter, and spring. Topics include basic courses on the Bible, Christian beliefs, spiritual practices, as well as discussions of current books and social issues. To view upcoming classes, visit our Adult Discipleship page.